Death Comes in Threes is my first time reading one of Kimberley O’Malley’s novels. 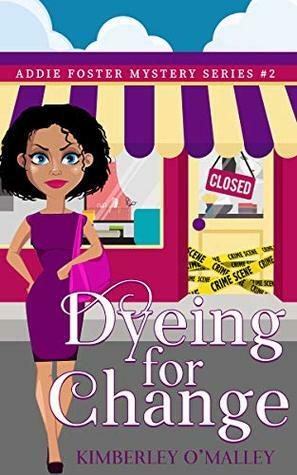 I was intrigued by the story from the beginning and Addie is a very fun, witty and likeable character. Grey is Addie’s supportive and easy going BFF who is there for her on a moments notice. Throughout the short time period taking place in this book, Addie has some very frightening and unexpected events happen. She rides through them like a trooper and seems to come out unscathed. The inserting of a handsome Detective also always helps! Some of the things I like about this novel are the energetic and funny characters. I love the Aunties and the dogs; albeit the thread of the two dogs I felt might have been overdeveloped. The novel was easy to read and the dialogue flows smoothly and naturally. The cover is also eye catching and makes you want to pick it up to see what it’s about. Some of the areas of Death Comes in Threes which fall flat for me are the mystery plot development, the overuse of some narratives and the length of the book. The mystery in the book isn’t very deep and could use a bit more complexity and intrigue. I want to know more about the three strangers and their deaths and not just a quick note saying they died, end of the story. I also wish there were a few more chapters. The third death was rushed and seemed like the author just wanted to end the book so #3 mystery man is found dead. If the story is called “Death Comes in Threes” I want to know about what happens to them, not in a weird way, but have more of a story behind it. Secondly, certain elements in the narrative were overused. Addie doesn’t need to stand by the door to dismiss the dark brooding Detective every time he comes to see her. Furthermore, every character in the story doesn’t need to stop and say how cute her dogs are, we get it. And thirdly, I just found the story too short. Add in more detail about the mystery. Lengthen the time between events and add a bit more meat and potatoes (this is entirely just my own opinion). All in all I would love to read the rest of Addie’s adventures to solve the mystery which this novel started. I feel like I have only read half of the story. 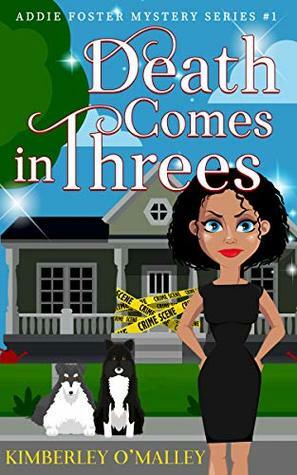 I want to thank NetGalley and the Publisher Laurie White / Carolina Blue Publishing for an e-copy of Death Comes in Threes to read and review. Just a quick book review if you are looking for a recommendation for some light reading this April! A Twist in Time by Julie McElwain is a time-shift historical fiction available April 11, 2017. A Twist in Time is chock-full of mystery and secrecy in upper class British society. The novel which takes place against the backdrop of London in the 1800s is a surprisingly good read! When I read the description I was expecting it to be a bit like Confessions of a Jane Austen Addict but this book was far better! Julie McElwain gives us a vivid view of life in 1815. Kendra Donovan the heroine of the series struggles to accept that she has been dropped somehow in 1815 and is thrown into a series of murder investigations. The literary is style engaging and Kendra’s character is confident and adventurous. The plot of “A Twist in Time” keeps up a good pace moving from scene to scene and I didn’t feel like there were any long and drawn out sections. Some time-shift novels have an heightened sense of implausibility but because Kendra has chose to trust the Duke of Aldridge and his nephew Alec with her secret, it somehow makes her presence in the 1800s more plausible. I also appreciated the author changing the point-of-view intermittingly from Kendra to some of the other characters to allow for differing perspectives. Kendra Donovan is an intelligent, solid and delightful heroine and I cannot wait to read more about her adventures. I also want to thank NetGalley and Pegasus Books for a pre-release copy of the book to read and review.